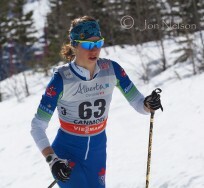 The Women’s Skiathlon was held on the second day of competitions of the Canmore portion of Ski Tour Canada 2016. The Women’s Skiathlon was composed of a 7.5 km Classic race followed by a 7.5 km Skate Race with just a ski exchange between the two parts of the Skiathlon. After a see-saw battle at the end of the race, Heidi Weng won and Therese Johaug was second. It was a Norwegian sweep with Astrid Jacobsen winning Bronze. 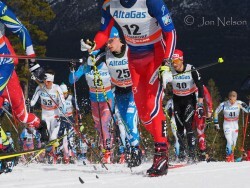 The Men’s race followed the Women’s race on March 9, 2016, the second day of races in Canmore. The Skiathlon was composed of a 15km Classic race followed by a 15m Skate race with a ski exchange between the two parts of the Skiathlon. Norway’s Martin Sundby was first followed by Sergey Ustiugov of Russia in second and Finland’s Matti Heikkinen was third. The Women’s Classic Pursuit race was held in Canmore, Alberta on March 12, 2016 and was the fourth and final race of Ski Tour Canada 2016. This race would determine the overall winner of Ski Tour Canada 2016. It would also strongly impact the final ranking of Female skiers over the year and would determine the winner of the Women’s Golden Globe. The Classic Pursuit race was won by Norway’s Therese Johaug and she also won Ski Tour Canada 2016 as well as the Golden Globe for best Female skier. The Men’s Classic Pursuit race was held in Canmore, Alberta on March 12, 2016 and was the fourth and final race of Ski Tour Canada 2016. This race would determine the overall winner of Ski Tour Canada 2016. It would also strongly impact the final ranking of Male skiers over the year and would determine the winner of the Men’s Golden Globe. The Classic Pursuit race was won by Norway’s Martin Sundby and he also won Ski Tour Canada 2016 as well as the Golden Globe for best Male skier. The Men’s Skate race was the third race of four men’s races held in Canmore, Alberta. These races completed Ski Tour Canada 2016. The March 11, 2016 interval start race was won by Finland’s Matti Heikkinen with Russia’s Evgeniy second and Sweden’s Marcus Hellner third. Posted March 21, 2016 in Cross Country Skiing Photography. The final images of the Canmore, Alberta portion of Ski Tour Canada 2016 are a few odds and ends not taken of the skiers in competiton. 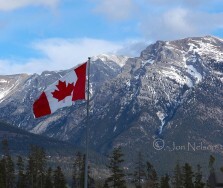 The Camore Nordic Centre is a wonderful a site for cross country ski racing. The trails are challenging and well maintained and the scenery is spectacular. The mountain trails combined with the best cross country skiers in the world gave a terrific opportunity to see cross country skiers in action. 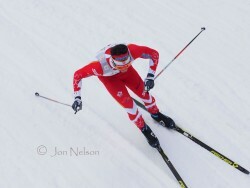 Other Galleries of Cross Country skiing – including ones from 2005 and 2008 Canmore races and the 1995 World Nordic Games in Thunder Bay, Ontario – can be seen at http://www.jon-nelson.com/category/cross-country-skiing or just go to Cross Country Skiing in the Photography section of this website. 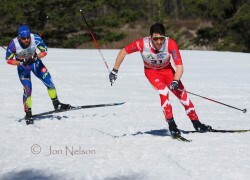 Posted March 30, 2015 in Cross Country Skiing Photography. The staff and volunteers at the Lappe Nordic Centre are known for their enthusiasm and expertise and they had the course and all the organizing well under control for the first day of the races. With temperatures well below freezing at night and hovering near freezing point during the races, the trail conditions were ideal. The competitions shown in this Gallery were Team Sprint races in the following categories: Men’s Canadian College and University Nordic Championships (CCUNC) , Challenge Boys and Open Men. 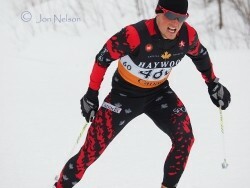 The 2015 Haywood Ski Nationals were held at the Lappe Nordic Centre from March 14 to 21, 2015 in Thunder Bay, Ontario. The Lappe Nordic Centre has world class trails and is known throughout Canada as a wonderful place to compete. The first day of racing featured Team Sprints and the course conditions and the weather were about as good as they could be. Photos in this section are of females competing in Team Sprint races. 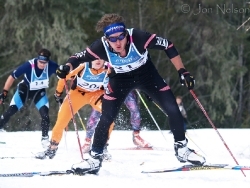 The categories were Women’s Canadian College and University Nordic Championships (CCUNC), Challenge Girls and Open Women races. The second day of competition featured Free Style (Skate) races with Interval Starts. The trail conditions were excellent and the weather was slightly warmer than the previous day. The Juvenile Boys race was 5 km and the Men’s CCUNC, Junior Boys and Open Men races were 10 km. The second day of competition featured Free Style (Skate) races with Interval Starts. The trail conditions were excellent and the weather was slightly warmer than the previous day. The Women’s CCUNC, Juvenile Girls, Junior Girls and Open Women races were 5 km races. Posted January 17, 2015 in Cross Country Skiing Photography. 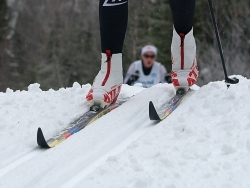 The first Ontario Cup for the 2014-2015 ski season was held on December 21 and 22 at the Lappe Nordic Centre. With the new snow, the race course was in great shape and the weather was a nice mix of son and cloud . Due to conflict with other races and uncertainty about the snow the turnout from outside of Thunder Bay was lower than expected. 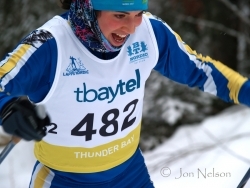 The races, however, were competitive and exciting and had people eagerly looking forward to the Canadian Nationals that will be held at Lappe in March. 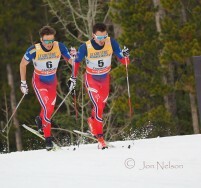 Posted March 7, 2012 in Cross Country Skiing Photography. 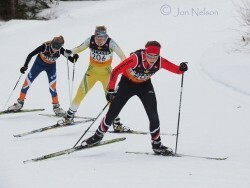 It is difficult to capture the speed and action of cross country ski racing. These photos were taken at a sprint race held on the Thursday night prior to the Sleeping Giant Loppet. I was unable to get good photos in the artifical light at the night race so I concentrated on trying to capture some of the flowing motion of cross country skiing. 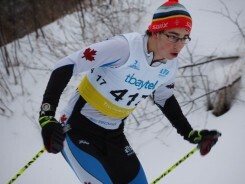 The first Ontario Cup of 2012 was held at the Lappe Nordic Centre near Thunder Bay, Ontario. A 3 km Classic Race was held in each race class on January 6th and Classic Sprints were held on January 7th. 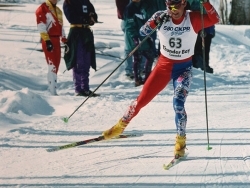 As a warmup for the Nordic Games the following year, from March 19-20 the last World Cup in the 1993-1994 season was held at Big Thunder in Thunder Bay, Ontario. 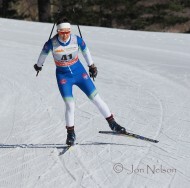 Posted February 15, 2011 in Cross Country Skiing Photography. The Sleeping Giant Loppet takes place in Sleeping Giant Provincial Park near Thunder Bay, Ontario every year on the first Saturday in March. 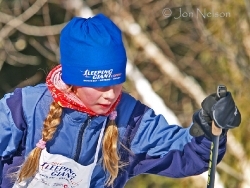 This loppet (formerly known as the Sibley Ski Tour) provides both recreational and competitive races in a variety of distances, including challenging and highly competitive 50km skate and classic races. Posted January 20, 2010 in Cross Country Skiing Photography. 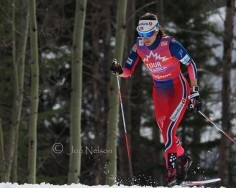 The 2008 World Cup, held in January at Canmore Alberta, drew many of the world’s top cross country skiers. The event was blessed with bright, sunny weather and cold, but not too cold, temperatures. There were four distance races: a 10km Skate race for women, a 15 km Skate race for men, a 15 km Pursuit for women and a 30km Pursuit for men. 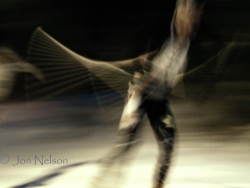 Posted January 19, 2010 in Cross Country Skiing Photography. Sprints were held in both classic and skate techniques at this World Cup in Canmore, Alberta. Chandra Crawford won the skate sprint to the delight of an enthusiastic crowd in her home town. 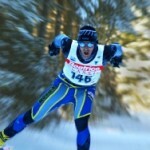 Posted January 17, 2010 in Cross Country Skiing Photography. 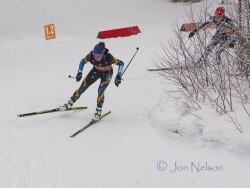 Skiing action from a few Ontario Cup races held in Thunder Bay at the Lappe Nordic Centre and the Kamview Nordic Centre from 2006 to 2009. 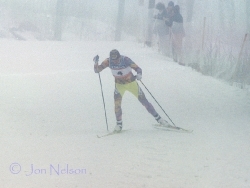 Posted January 16, 2010 in Cross Country Skiing Photography. Canmore, Alberta was host to a World Cup from December 12-15 in 2005 and Canadian skiers showed they could compete successfully against the best in the world. Beckie Scott won a silver medal in the 10 skate race and she and Sara Renner skied to silver medal in the team sprint before a large, enthusiastic audience. These photos were taken on slide film and the slides were then digitalized to use on the website. 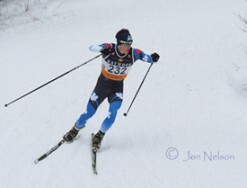 Posted January 15, 2010 in Cross Country Skiing Photography. A collection of cross country photos from many venues and through many years. Photos were taken in Thunder Bay (Lappe Nordic Centre, Kamview Nordic Centre and one at Big Thunder) with the exception of photos from trails near Atikokan, Ontario.